Two B-52 heavy bombers flew "in the vicinity of the South China Sea," US Pacific Air Forces said June 6. While US Navy warships sometimes conduct "freedom of navigation" operations in the South China Sea as a way to challenge what Washington maintains are Beijing's excessive maritime claims, flying the potentially nuclear-armed B-52s over the waterway represented an "escalation," Business Insider reported Friday. 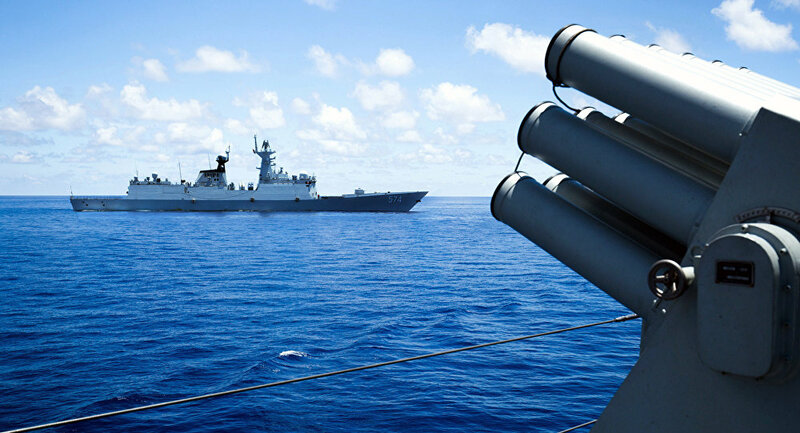 On Friday, the PLA-Navy practiced its responses to an aerial attack on islands in the South China Sea. Chinese forces targeted three unmanned aerial vehicles flying in formation "at varying heights and directions" as part of efforts to improve the force's fighting ability, the South China Morning Post reported, citing a PLA Daily report. On Friday, Chinese President Xi Jinping "stressed building an elite maritime force to resolutely accomplish various missions entrusted by the Party and the people" while visiting a navy outpost, Xinhua reports. A senior US general issued a subtle warning late in May — whether intentionally or not — that the US military "has had a lot of experience in the Western Pacific, taking down small islands." China has been building on small islands in contested parts of the sea, erecting civil and military infrastructure, to the consternation of the US and Asian nations with competing claims to the areas. US Secretary of State Mike Pompeo visited China Thursday where he "reaffirmed [the US'] deep concerns about the building and militarizing of outposts in the South China Sea," according to spokeswoman Heather Nauert. "Those actions increase tensions, complicate and escalate disputes, endanger the free flow of trade, and undermine regional stability." "But China is unlikely to follow what the US wants as [Beijing] is also looking to expand its military presence in the South China Sea with the hope of turning the region into an area under its military dominance," Li Mingjiang, a professor at the S. Rajaratnam School of International Studies at Nanyang Technological University in Singapore, told the SCMP.